The aim of this publication is to provide a concept for prevention and a standardized step-by-step clinical approach to this rare but serious and potentially preventable complication of dental local anesthesia. 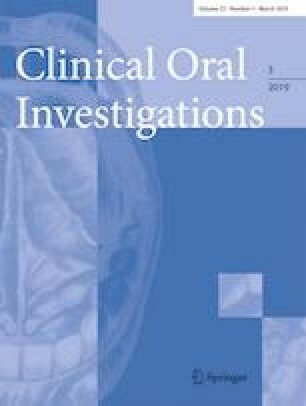 We collected data with a PUBMED search using the key words “local anesthesia,” “dental anesthesia/anesthesia” OR “mandibular block anesthesia,” “complication,” “hypodermic needle,” “needle breakage” OR “needle fracture,” and “foreign body AND removal” OR “retrieval.” The existing literature was systematically evaluated from 1980 to date using Microsoft Excel 2007 (Microsoft Corporation). After analysis of the literature, we included 36 reports documenting 59 needle breakage events and defined possible risk factors and preventive measures. All relevant reported parameters were listed in tabular form. The main result of this article is a treatment algorithm for this complication. Prevention of a needle fracture should be the main goal during local dental anesthesia. Use of longer hypodermic needle can obviate complex retrieval surgery. If immediate removal of the fragment fails, localization, planning, and the necessary surgical procedure should be arranged promptly. Following a strict algorithm, successful surgical handling of this complication will depend on minimizing risk and following treatment recommendations closely. Stephan Acham and Astrid Truschnegg contributed equally to this work. As the basis for patient-centered pain-free dental therapy, local anesthesia is one of the most frequent interventions in dentistry and one of the main factors that has allowed an image shift from dentistry as a very anxiety-driven necessity to a modern doctor-patient partnership. Local anesthesia is associated with a low overall incidence of serious complications [1, 2]. Possible risks and complications include systemic reactions such as hypertension, collapse, and toxic or allergic reactions, or local events such as pain, hemorrhage, infections, soft tissue damage, and ophthalmic or nerve disorders, as well as dislodgement of fractured hypodermic needles. The latter can lead to serious and potentially life-threatening consequences by violating adjacent vital anatomical structures [3, 4, 5, 6, 7]. Extraction of the broken fragment is—with very few exceptions—generally recommended and should be undertaken as soon as possible. Reasons for needle breakage can be manifold. The most common cause in the past, fatigue fracture of sterilized re-usable dental needles, could be largely eliminated by the introduction of standardized disposable cannulas made of resilient stainless steel in the 1960s . The authors found no scientific report of re-usable syringes for local anesthesia after the late 1970s. Today, prevention of failures in the technical implementation is the most important preemptive measure. Although there is general consensus that preventive measures are particularly important and fragments should usually be removed promptly [2, 4, 6, 9, 10, 11, 12, 13, 14, 15, 16, 17, 18, 19, 20, 21, 22, 23, 24, 25, 26, 27, 28, 29, 30, 31], it is remarkable that no guidelines, especially for the surgical procedure, have yet been published. After two cases of a needle breakage presented in brief in the “Results” section, which were referred to the University Clinic for Dental Medicine and Oral Health of the Medical University Graz, Austria, we searched the relevant literature for data to help us determine how to avoid needle fractures and retrieve fragments. The aim of this paper is to provide a concept for prevention and a standardized approach to this complication. In addition, we reviewed the literature for recommended treatment strategies including diagnostic measures and the timing of surgical actions. Based on these results, we developed a definitive treatment concept. For the time period from 1980 to date, a total of 36 valid reports and reviews including reports were found documenting 59 cases of broken hypodermic needles during dental local anesthesia. 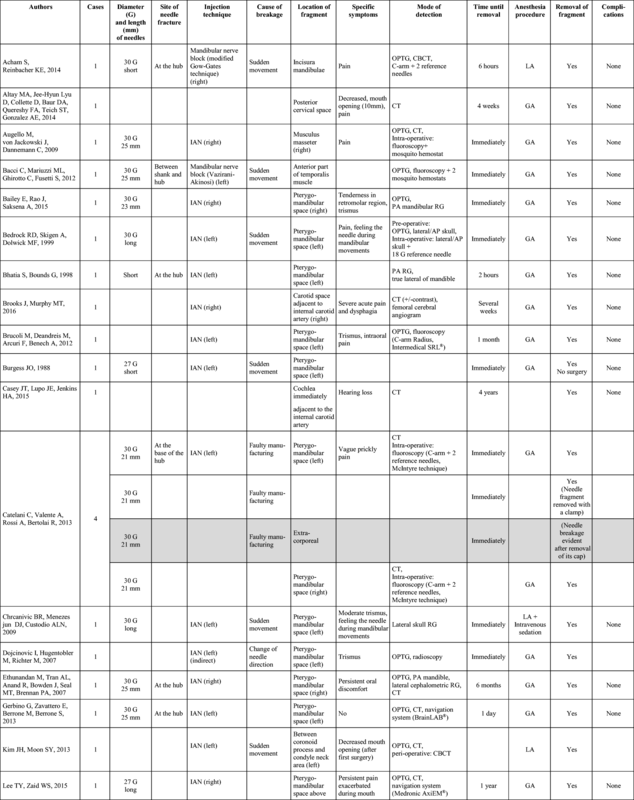 All cases were evaluated according the defined parameters described in detail in the following (Table 1). In 40 out of 59 cases, diameter was reported: in 1 case 31G (2.5%), in 31 cases 30G (77.5%), and in 8 cases 27G (20%). Length varied between 21 (short) and 35 mm (long). Prebending was reported in 12 cases. Eleven cannulas broke at the hub. In one case, 2/3 of the needle broke off. The fracture point is not reported for remaining 47 broken needles. For 51 out of 59 cases, the injection technique is reported. Needles broke predominantly in the course of inferior alveolar nerve blocks (IAN) and mandibular nerve blocks (Vazirani-Akinosi or Gow-Gates, respectively). They were fairly evenly distributed between the two sides (22 left/43.1%, 24 right/47.1%, 1/2% not defined). Four instances (7.87%) occurred in the course of unspecified infiltration techniques. Sudden movement was reported to have caused the vast majority of needle breakages. Fifteen cases were definitely described as such and “most” of the16 cases reported by Pogrel . Three cases are reported as manufacturing defects. 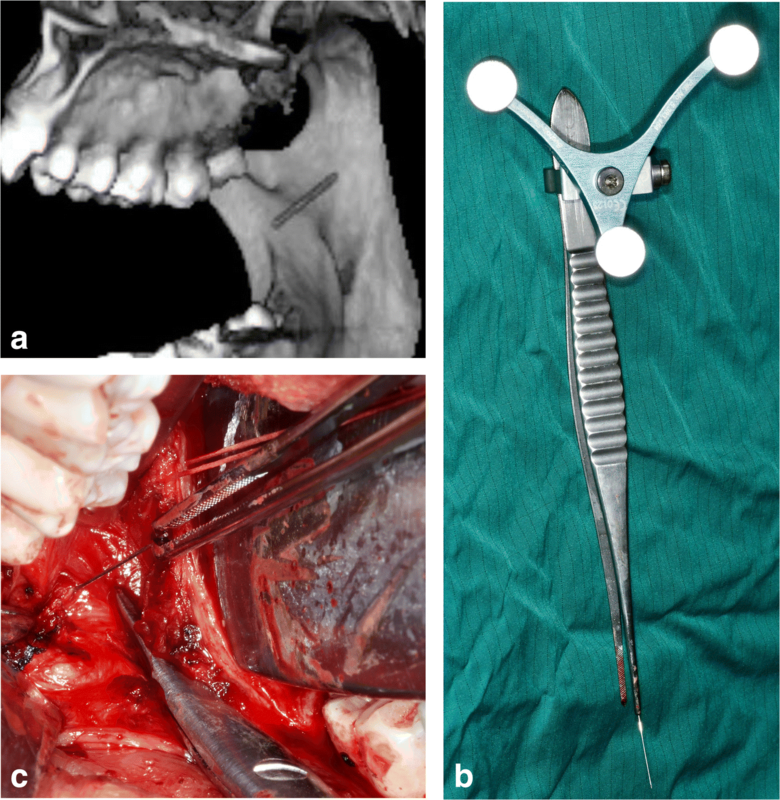 The literature indicates that the vast majority of needle fractures occur with inferior alveolar and mandibular nerve block anesthesia, with fragments predominantly situated in the pterygomandibular region. For 43 out of 59 cases, the localization of the fragment is reported. Noteworthy is that one cannula broke extra-corporally  (gray shaded). Of the 27 out of 43 (62.8%) cases in the pterygomandibular space, 13 were located on the left and 13 on the right side; in one case, the side was not given. Three of the pterygomandibular needle fragments migrated significantly. One moved to the base of the skull , one to the external auditory canal , and one fragment migrated from the lingula region to the superficial post-auricular area . In 16 out of 43 cases (37.2%), the location was other than the pterygomandibular space, including four needle fragments in the posterior maxillary region. For 16 broken cannulas (15/Pogrel , 1/Catelani et al. ), no exact location is given. Notably, four broken needles were described as lying adjacent to important head and neck arteries. Brooks and Murphy  and Casey et al. each described a fragment in the immediate anatomic vicinity of an internal carotid artery, whereas Okumura et al. found a fragment adjacent to the right external carotid artery. Queiroz et al. described a fragment close to left facial artery. One further location was not defined . Authors make no reference to specific symptoms for 30 out of 59 patients. Twenty-three patients suffered from pain and/or tenderness. Out of these 12 developed trismus, and three further patients additionally presented swelling and dysphagia. One additional patient presented with “perception of object presence” and one with unilateral hearing loss. Four patients were definitely asymptomatic. Techniques for 2D visualization like orthopantomograms or skull X-rays were performed in 32 cases. These were applied as a basis diagnostic tool, for preoperative planning, or for intra-operative orientation. 3D scans were reported in a total of 22 cases, preponderantly conventional computed tomography (CT) scans of the region. For three interventions, the additional use of a navigation system is documented. Only three cone beam computed tomography (CBCT) scans are described for this indication. The application of interventional radiography (RG) for a stereotactic locating procedure was referred as “fluoroscopy,” “image intensifier,” “C-arm,” or “X-ray TV.” For 13 cases, the use of marker bodies (e.g., reference needles) was mentioned. Two removals were accomplished with a metal detector. In 39 out of 59 cases, information concerning time until removal was given. Twenty-one needle fragments (53.8%) were removed immediately (within 1 day after event), an early removal (within 3 months) was achieved in 12 cases (30.8%), and one fragment (2.6%) emerged spontaneously after 2 weeks. In five cases (12.8%), removal of fragments was delayed (3–12 months) or late (> 1 year). For 51 out of 59 cases, the anesthetic procedure was reported. Seven fragments (13.7%) could be removed under local anesthesia (LA), whereby three of those interventions were performed under additional intravenous sedation. The majority of removals (44 cases/86.3%), however, were accomplished under general anesthesia (GA). For eight cases, the anesthesia method was not given. Fifty-six out of 59 (95%) fragments were successfully removed, whereby one fragment erupted spontaneously. Removal was not intended in two cases. One needle fragment had never been in patient’s contact. Information on complications was available for 33 patients, 30 (91%) of whom had no complications; two (6%) had prolonged trismus and one (3%) paresthesia of the mandibular nerve. For 26 patients, there was no information on post-operative complaints. Patient #1 was referred with a 30-G broken needle after dental anesthesia with Gow-Gates technique . A CBCT scan showed the position of the needle next to the medial surface of the coronoid process. 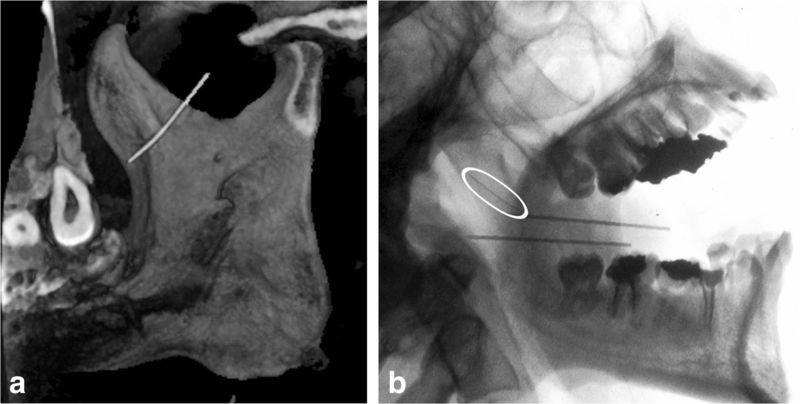 As the patient was calm and cooperative, the fragment could be removed after a mucosal incision perpendicular to the trajectory of the needle followed by blunt dissection under local anesthesia (Fig. 2a, b). Patient #2 was referred to our clinic with a 30-G broken needle after anesthesia with inferior alveolar nerve block techniques (IAN) for right lower third molar removal. An immediate CT scan showed the needle at the median side of ascending ramus close to mandibular foramen. Removal was possible under ITN with intra-operative navigation (Fig. 3a–c) thanks to patient’s good psychomotor condition. Although needle breakage in dental anesthesia is a rare complication, it does attract a certain amount of attention in the scientific literature. Augello et al. reported 16 needle breakage events treated surgically in a single center over a period of 25 years. The actual number of such events is certainly significantly higher than reflected in the literature, since the dentist can often remove the needle fragment immediately with simple measures. Considering the possibility of serious and potentially life-threatening consequences of migrating sharp metallic objects in the light of the frequency of administration of dental anesthesia, awareness of this complication deserves to be raised. Even though many authors [2, 4, 6, 9, 10, 11, 12, 13, 14, 15, 16, 17, 18, 19, 20, 21, 22, 23, 24, 25, 26, 27, 28, 29, 30, 31] advise removal of the needle fragment with all due speed, there are no generally accepted recommendations or guidelines on how this should best be accomplished. We propose to close this gap with a general treatment algorithm that integrates the collected data on needle breakage reports since the 1980s. This time limit was chosen to eliminate with a high degree of certainty earlier reports of fractured reusable needles and only cover modern disposable cannulas. In their literature review published in 2013, Catelani et al. reported 82 cases of broken dental needles since 1965. Augello et al. reported in their review that 70% of cases of needle breakage occurred with inferior alveolar nerve block anesthesia, making the pterygomandibular region the predominant location of the fragment. Pogrel  estimated the incidence as one case per year in 14,000,000 based on data collected in northern California. The pterygomandibular space is situated between the medial pterygoid muscles and the medial surface of the mandibular ramus on each side. It communicates with the infratemporal space superiorly, the lateral pharyngeal space and the peritonsillar space medially, the buccal space anteriorly, the submasseteric space laterally, and the parotid space posteriorly. It mainly contains fatty tissue and is transversed by numerous neurovascular structures such as the lower alveolar artery, a branch of the maxillary artery, and the mandibular division of the trigeminal nerve. For an inferior nerve block, the needle should be inserted between the muscle tendons of the temporalis muscle and the medial pterygoid muscle directly into the pterygomandibular space  and penetrate about 21 mm into the soft tissue to reach the mandibular foramen . Patients should be told what to expect and advised to avoid sudden head movements. In children or anxious adults, a topical anesthetic might be beneficial. The mandible should be held firmly while palpating the ascending ramus of the mandible to assess the local anatomy. The needle point should be inserted in the shortest and most direct line to the dental foramen between the muscle tendon of the temporalis muscle and the medial pterygoid muscle to avoid bending during the injection process. The needle should not be embedded to the hub. No force should be exerted on the needle and there should be no resistance to the injection. If bone is struck, the needle should be withdrawn; injection into the periosteum should be avoided. If a change of direction is necessary, the needle should be removed entirely and reinserted in the right orientation [2, 5, 14, 25, 34, 36]. The literature mentions several risk factors associated with an increased incidence of needle fracture. Rahman et al. , Zeltser et al. , Catelani et al. , and Säkkinen et al. recommend that the needle first be checked to rule out any visible manufacturing defects. Other risk factors mainly concern correctable deficiencies in handling and technique, patient management, and needle choice. In 1968, Aldous  used an experimental setup to prove that the physical properties of needles vary in relation to their length and gauge, finding that the deflection of a needle is directly correlated to its length and indirectly to its diameter. 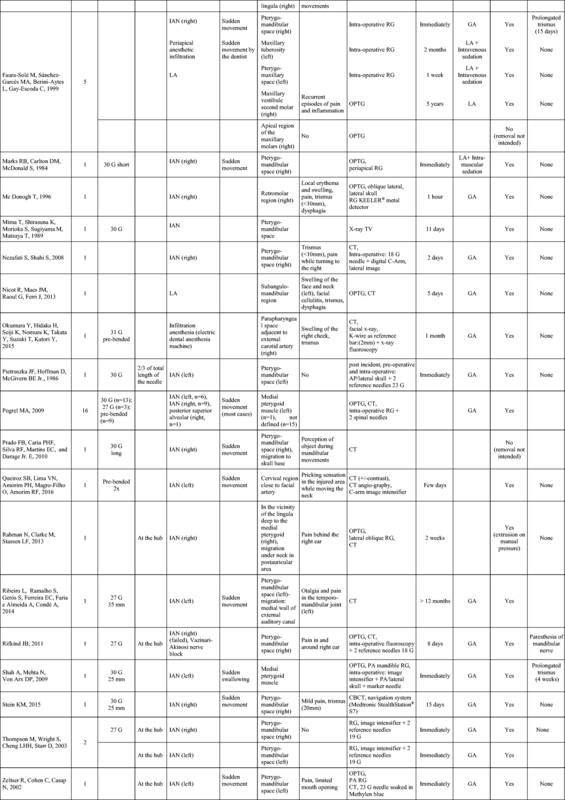 Most reported cases of needle fractures involved thin needles, 30-gauge or smaller [2, 3, 8, 12, 14, 15, 19, 22, 24, 25, 26, 28, 29, 39, 40, 41]. Therefore, Thompson et al. , Ethunandan et al. , and Pietruszka et al. recommend the use of needles with at least 27-gauge diameters. It has further been shown that a very small caliber cannula does not cause significantly less pain than a larger one. Lehtinen  stated that 30-gauge cannulas showed significantly less mucosal penetration resistance than 27-gauge needles, but pain perception “was less remarkable.” Fuller et al. demonstrated that patients’ pain perception did not differ when needle diameters between 25 and 30-gauge were used. Kudo  reported that anxiety and pain are directly related to initial injection pressure. According to Aldous , a greater diameter associated with lower injection pressures causes less pain and in addition may diminish the risk of cannula breakage. Several authors [8, 19, 30, 45] mentioned that the risk of needle breakage may increase after prebending. Nevertheless, Van den Akker  states that a so-called “thin-wall” needle will not break during bending. The author experimentally demonstrated that a needle primarily breaks adjacent to the hub after repeated bending. The use of a long needle provides additional safety in the case of needle breakage, as it is more likely that the needle fragment can be grasped if it extends beyond the mucosa. Dojcinovic et al. also mention this and recommend that at least 5 mm of the needle should remain above the mucosa level to allow easy removal of the needle fragment. Changing the needle if repeated injections are needed. If a needle breaks and the fragment is still visible, it should immediately be grasped with forceps or a hemostat. As soon as there is any movement, the patient swallows, or the dentist does any digital manipulation, the visible fragment may disappear as the tension of the tissues is released . If the needle cannot be removed immediately, the patient has to be informed and asked to limit speaking, swallowing, and moving the mandible as far as possible. Placing a bite block may help the patient to maintain a stable position. Basically, in accordance with Augello et al. , Amies et al. , Fraser-Moodie , Fitzpatrick , Bedrock et al. , Thompson et al. , Ethunandan et al. , Chrcanovic et al. , Catelani et al. , Gerbino et al. , Kim and Moon , and Pietruszka et al. , we recommend the removal of broken needle fragments as soon as possible, even though cases of delayed removal are described in literature [6, 19, 32, 47]. Nevertheless, the time of removal has been discussed controversially. 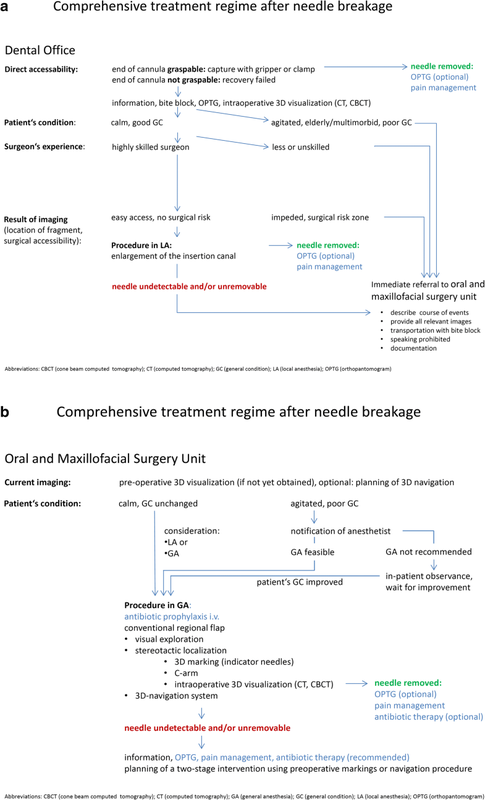 In 2004, Malamed  suggested leaving needle fragments in situ as long as they cause no symptoms (e.g., pain, dysphagia, trismus, or needle migration), whereas in 2010, the same author  recommended an immediate referral to a surgical specialist. Reck and Fielding  and Zeltser et al. also argued for removal in particular situations. Prado et al. even recommended avoiding retrieval procedures in cases “involving risks of irreparable sequelae.” In that context, the risk of the fragment’s migration with the inherent danger of violation of vital structures has to be considered [3, 4, 5, 6, 7]. In any case, detection and removal can be difficult. Panoramic radiographs should be taken routinely for documentation immediately after any incident. Archer et al. and Kennett et al. recommended additional radiographs, usually lateral and posterior-anterior views, to estimate the approximate three-dimensional position for the routine preoperative assessment. For the past two decades, a trend to exact preoperative diagnosis has improved preoperative planning and generally increased surgical success; today, three-dimensional imaging techniques have become standard for visualizing foreign bodies. Since the early 2000s, most reports have concentrated on preoperative computed tomography. In the most recent literature, CBCT has been used for this indication [27, 28, 41], as this cross-sectional imaging technique usually is readily available and is especially suitable for cases of limited surgical accessibility. Twenty-seven out of 57 cannula fragments reported in our research were located in the pterygomandibular space, where 3D diagnosis may be generally indicated. Another advantage of computed tomography is that not only the fragment but also surrounding structures like vessels and the parotid gland can be imaged . In many cases, additional radiographic images with reference needles placed in situ were made intra-operatively. This is done either with repeated radiographs or interventional radiography for stereotactic localization [8, 14, 16, 20, 22, 23, 24, 25, 28, 39, 52]. Current developments point toward cross-sectional based navigation systems as described by Gerbino et al. , Lee and Zaid , and Stein , which are particularly suitable for cannula retrieval procedures in difficult cases. Magnets are not helpful , as Russel  already showed in 1970 that stainless steel hypodermic needles have a very slight response to magnets. Only McDonogh  and Okumura et al. described successful application of a metal detector for needle retrieval. Our personal experience indicates that reflex signals from a stainless steel dental needle fragment are too weak for an exact localization. Most authors describe and/or recommend the removal of a fractured needle exclusively in general anesthesia [5, 6, 8, 13, 14, 15, 16, 18, 19, 20, 22, 23, 24, 25, 26, 29, 30, 31, 32, 33, 39, 41, 46, 52, 54, 55, 56]. But there are also cases of successful removal of cannula fragments in local anesthesia [12, 21, 27, 28, 47]. It can also be assumed that numerous cases of simple retrievals do not appear in the literature. From our point of view, the main decision-making factor for local versus general anesthesia is the patient’s condition and the anatomic position of the fragment. As most needles break during the inferior alveolar nerve block, the fragment is generally lodged in the pterygomandibular space. For surgical removal, many authors recommend a superficial mucosal incision perpendicular to the trajectory of the needle followed by blunt supra-periosteal dissection to spare vital structures and identify the needle [12, 14, 15, 46, 47]. On the other hand, Ethunandan et al. chose to start with a vertical incision along the anterior border of the mandible, extending to the oblique line, followed by initial subperiosteal dissection along the mandibular ramus to identify the lingula as a bony landmark for reference and to provide greater protection to the inferior alveolar and lingual nerves. This is followed by extra-periosteal dissection. In any case, the procedure must be performed by an experienced surgeon, as damage to nerves and vessels can be serious complications. When a dental needle breaks, immediate action must be taken. If graspable, the fragment should be removed immediately. If not, the patient should be transferred to a well-equipped surgical unit for diagnosis and surgical management. Dental hypodermic needles break only rarely now, but such an incident can be life threatening. In that context, it is important to raise awareness of this complication in the dental community. A concise treatment algorithm for quick and proper management will guide dental practitioners in dealing with this infrequent adverse event. For this type of article, formal consent is not required.